Reuters: Nothing less than victory at the BMW Championship this week will give Xander Schauffele a chance of forcing his way onto the American team for this month’s Ryder Cup, the former frontrunner for a captain’s pick has said. United States captain Jim Furyk will announce his final wildcard pick on Monday to complete his 12-man line-up to take on the Europeans in Paris from Sept. 28-30. “I feel like I do,” Schauffele, who carded a seven-under-par 63 to trail leaders Tiger Woods and Rory McIlroy by one stroke on Thursday, told Golf Channel when asked whether he thought he needed to win at Aronimink to earn the nod from Furyk. 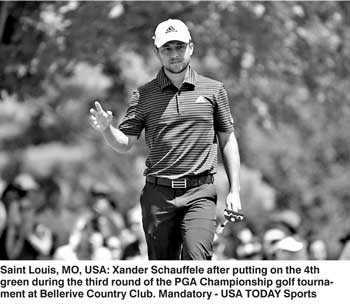 Schauffele, the winner of last year’s Tour Championship, had been among the frontrunners for a Ryder Cup spot with strong performances at the U.S. Open (equal sixth) and British Open (equal second). His form had since tailed off and he acknowledged that long-hitting Tony Finau, who also had top-10s at the U.S. and British Opens, was in pole position to grab the coveted spot.